One of the main tenets of The Brvtalist is to connect the dots between different eras, disciplines and mediums. Architecture, furniture and interior design are so interconnected but striking the right balance is incredibly difficult. That's why the discovery of London-based design studio Hopper + Space was a true gift. The duo of Ben + Joe create interiors that are progressive and forward-thinking, while referencing some of the best time periods of interior and furniture design of the past. The studio has also released a new range of original furniture that successfully fuses their knowledge of style and design with the latest technology, making the pieces feel very fresh. The Brvtalist reached out to the duo to find out more about their background, approach and original line of furniture and they graciously provided us with some great responses. Please find the Q&A below. Techno Chair for L'oreal designed by Philippe Starck. Available for purchase through Hopper + Space. The Brvtalist: I would love to get a brief background on you both. What were you both doing before H+S? I know you design home interiors, restaurants and now even furniture. Has Hopper + Space always existed in this form or have your practice areas expanded over time? H+S: Before Hopper + Space existed Joe worked for a wildlife rehabilitation charity and Ben worked in recruitment. We've both always loved design, interiors and art from an early age. As children we both loved raking about in Jumble sales and Charity Shops looking for the interesting, the old and the unusual. From the start of Hopper + Space midcentury furniture pieces have been our main area of work. We've spent years finding, researching, restoring and selling the less common designs from small British cabinet makers alongside pieces from the more popular brands such as G Plan or McIntosh. We've spent a number of years sourcing and reupholstering 20th century sofas, armchairs and daybeds. From the start we knew they had to be vibrant and eye catching. With our reupholstered pieces we like to give them a one off feel. One of our favourite pieces was a 1950's Ercol Studio Couch which we reupholstered in fabric designed by Christian Lacroix. Being so interested in design and interiors progressed into an interest in launching our own range of furniture. Our Original Range is in a midcentury style but updated for the modern home. From time to time we would get asked to source pieces for restaurants, cafes, offices and meeting rooms. This led to us being asked by several companies to redesign areas of their premises and even a college to redesign their whole canteen and design studios with a vintage industrial feel! It's fantastic to see pieces you've restored alongside pieces you've designed come to life in a public space. We've always had an interest in latecentury design and have recently been exploring furniture and interiors from the 1980's and 1990's. There are some great pieces out there and tons of unexplored design history. TB: I love the dots you connect in all aspects of your work. Linking the connecting points between different periods of design is no easy task. We know b/c we try to do something similar on our site! Talk about how you find the connections between art deco, mid century, post modern/Memphis, etc. and create something that is still of the moment or even the future. H+S: Good design transcends time. We think the key is to mix it up and keep it fresh! For example a faithful reproduction of a 1940's living room is cool but we wouldn't want to live with the heavy style 24/7. Mixing up antiques and pieces from all decades with contemporary pieces is definitely the way to go if you want to connect the dots in your own home. TB: I've been so into the Memphis School for a while and love pretty much all of the pieces you have on your online shop. How do you approach looking for items for your projects or to sell? Do you base it purely on design, rarity, build quality or something else? 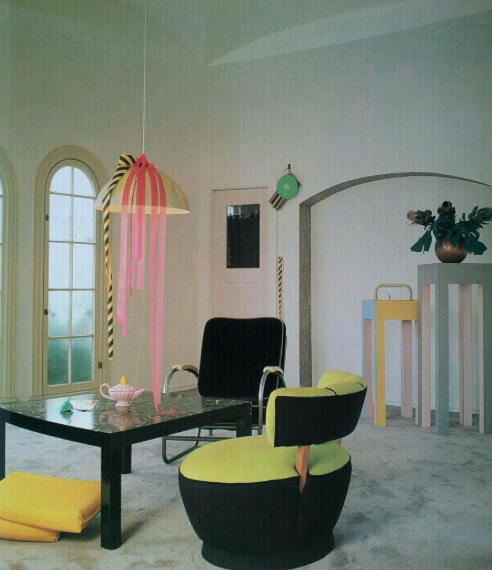 H+S: Since seeing houses in films as children we've both been fascinated by the Memphis designs and post modern pieces. The beautifully vulgar excess of Bette Midler's house stuffed full with Memphis Milano replicas in the film Ruthless People and the creepy post modern meets gothic vibe of the house in Beetlejuice both really stuck in our minds. We're really excited to be exploring the 80's/90's designs of the Memphis Group members, Ron Arad, Niels Gammelgaard, Philippe Starck and many others at the moment. We've been collecting Memphis and latecentury pieces ourselves as well as offering them for sale on our site and find there are some stunning designs out there. When sourcing pieces we go for designs that we like. Something that catches our eye and has got it. It could be a Memphis Milano lamp or a piece by an unknown designer but if we like the style and it catches our eye the chances are we'll go for it. TB: What inspired the new range of furniture? We love the Bloc sofa and how it takes some ques from the Soviet Era. Talk about the process of creating this first piece. H+S: Thanks, so glad you like it and want to feature it in your site. Our Original Range of furniture is inspired by 20th century design. We wanted to take the midcentury aesthetic and offer a range of furniture that has its wonderful style yet looks fresh in a modern space. Our BLOC range is inspired by Eastern Bloc modernism. We were looking at the Brutalist architecture of the Soviet era and kept noticing the furniture. A sort of boxy, slightly chunky version of midcentury furniture design. The more we looked into it the more we fell for its style. It was important for us to work with the very best upholsterer we could and offer quality furniture pieces that are built to last. TB: What are some projects your currently working on that you're excited about and/or whats next for H+S? H+S: We have more of our Original Range designs ready to go into production. As for our 20th Century pieces we've been sourcing some fabulous pieces designed by Philippe Starck, more 80's Ikea and early 1990's furniture from London based designers. The Brvtalist would like to thank Ben and Joe for taking the time to answer some of our questions. It's always a thrill speaking with others who shares the same mindset (and aesthetic) as myself. Please visit Hopper + Space for more information. Also, be sure to connect with them on Facebook, Instagram and Twitter. From left to right: 1. Hopper + Space Bloc sofa. 2. ACHILLE CASTIGLIONI FOR ZANOTTA PLANT STAND - Available through Hopper + Space. 3. Late century interior inspirations.